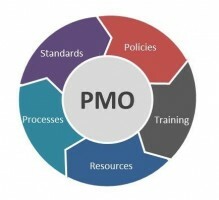 As the Office of Management and Budget (OMB) works on implementing the Program Management Improvement and Accountability Act (PMIAA), Federal agencies are considering how to incorporate PMIAA into their agency programs and processes. Many agencies have pockets of program management excellence, but the real challenge is connecting the isolated pockets to improve program management of the Federal government overall. I recently presented on government program and project management offices at the University of Maryland’s 2017 Project Management Symposium. I am researching the current state of the Federal agencies’ program and project management offices. My purpose is to determine the number and structure of Federal program and project management offices. My research will establish a baseline to measure the impact of PMIAA. There is much research on the benefits of project management offices in the private sector but few empirical studies on government project management offices. Two studies provide insights into how to implement PMIAA. What Makes a Project Management Office Successful? Project support to offload administrative burdens such as reporting and software operations from project managers. Consulting and mentoring, whereby professional PM expertise such as proposal development and project planning is provided. Training to enhance individual skills and to encourage professional certification. Assisting in staffing projects with project managers. Playing a high-tech project support role by enabling virtual project offices across geographical and organizational distance. Of all the services offered by the project management office, two services were found to have a high correlation with project management success. The first is the establishment of project management standards and methods. Project management offices that create manage and maintain organization wide standards, tools and practices have the most impact on the organization’s project successes. The second service is the knowledge management function. Project management organizations that keep and disseminate lessons learned also increases the organization’s project successes. These two services are closely related as the lessons learned help refine the project management organization’s set of standards and practices. Can Private Sector Best Practices Be Successfully Transferred to Government Project Management Offices? Subject to laws, regulations and oversight that exceed those of private organizations. Because of these differences, the researchers advise that government agencies pay close attention to training the agency workforce in program and project management, establishing organization wide standards and practices, and investigating delays and problems. Then, when adopting a best practice, rethink how the best practice will operate in the government environment. The agency should carefully monitor the progress of the best practice and use a robust lessons learned process to refine the best practice continually. PMIAA may have just as much impact (if not more) on the Federal government’s ability to deliver services. Reforming government has been a consistent aim of many presidential administrations with mixed results. Part of the problem with reforming government is that attempting to transplant best practices without considering the special environment of government reduces the usefulness of the best practices. PMIAA is different because reforms are already established in the agencies’ pockets of excellence. PMIAA’s contribution is to help build program and project management capacity among the Federal workforce, create government wide standards and establish a government wide council to spread best practices. As the research shows, these are the correct steps to creating high performance program and project management offices.